With a title like Terrorvision, a movie can really go either way, but you know it won’t be mediocre. The very first shot is a close-up of the monster, which reminds me equally of Audrey II and the one-eyed creature from Pee-Wee’s Playhouse. What we have here is a bonafide monster movie on our hands. Reminiscent of Night of the Creeps, an alien civilization disposes of something which, naturally, finds its way to Earth. This is the prologue before the opening credits, which are accompanied by an 80s pop song designed specifically for the movie. It’s not a particularly good song, but it hints Terrorvision is the kind of movie which doesn’t take itself too seriously. The filmmakers obviously think you might as well go big or go home. And they go big in such a way it’s almost exhausting, but rarely boring. The acting is so over-the-top it goes well past the point of being funny, becomes downright stupid (and sometimes obnoxious), and somehow gets funny again. Its sitcom-quality sets frame the actors—many of who you’ll recognize—in a way it’s perfectly clear this is a boiling hot piss-take on suburban life in the eighties. The Puttermans have just installed a satellite dish on the edge of their property. Home systems back then were the size of SETI dishes and were usually found in between above-ground pools and broken trampolines. Grampa thinks it’s a radar dish; when the family channel-surfs to an old war movie, he shouts, “Troop movements!” and tightens his grip on the loaded gun which never leaves his side. What the Puttermans don’t know is a monster, which is later described as an energy being, has made the new TV system its new home. 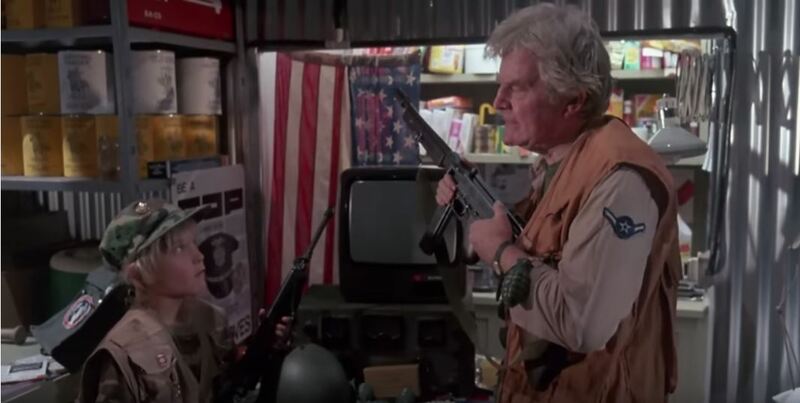 Grampa and the little boy are the first to discover the terror in the television and waste no time arming themselves with the old man’s collection of military-grade weapons, which are stockpiled in his vault-like bunker beneath a confederate flag. The monster begins picking victims off one by one and the movie doesn’t go amiss until the extended parody of E.T. Don’t worry, though: it won’t be long until the monster flips out and starts killing again. 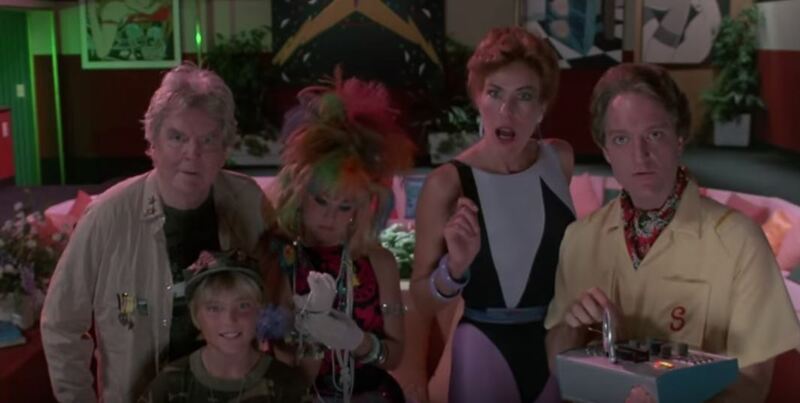 Terrorvision is a refreshingly fast-paced horror film which currently scores a 0% on the Rotten Tomatoes. Sure, it’s stupid, but it’s not stupid, if you know what I mean. I would guess very few directors could succeed at making something so oddball even if they tried—and most wouldn’t want to. This movie is just too damn weird not to enjoy.